Pocket Gamer url removed, their site is triggering my norton antivirus atm. Nintendo transformed its flagship world store into a carnival of Animal Crossing fun, games, and prizes today to celebrate the launch of the Pocket Gamer Gold Award-winning Animal Crossing: New Leaf. The game isn't actually available in the states until tomorrow, but a few intrepid souls willing to brave the queue (some were there as early as 5am!) picked up the game - or the limited edition 3DS XL - a day early. With camera in hand, we sneaked past the line to bring you pictures of the event which runs until 1pm on Saturday. The Nintendo World Store hosts events like this to celebrate launches of important first-party titles, so if you missed today's event you may want to check back around the retail releases of Mario & Luigi Dream Team, Pokemon X and Y, or A Link to the Past 2. But enough about that - it's time for the pictures! Pocketgamer's entire site started triggering my anti virus so I removed the urls to those photos in the op. So I ran to Walmart to pick up milk for my mom....Walmart had 8 copies available for purchase. They had to turn away FIFTEEN PEOPLE because they ran out of copies at 12:05am And that was when I left. I can't even imagine how many people are gunna show up throughout the DAY only to find out it was sold out at midnight! I never had ANY interest in getting a 3DS before, mostly bc my eyesight is so bad now that I can't see most of Rachel's games on her system anyway! BUT.......I have loved Animal Crossing since it first came out, years ago!, so Rachel talked me into buying the special system with the game preloaded. Since the game is more slow paced, I'm HOPING I'll be able to make enough out to be able to play it! Will find out in the morning! Keeping my fingers crossed!! Don't be fooled by Animal Crossing: New Leaf's cute and cuddly façade. Beneath those happy smiles and talking anteaters, there lies an intricate web of economic models and complex systems that would make a Wall Street analyst break out in a cold sweat. You can build a fruit empire. You can gamble on the turnip stock exchange. You can make a fortune from fish, or make your mint with hybrid flowers. To help you make the most of your time as mayor of Bumville (or whatever you happen to name your hamlet), we've put together this list of Animal Crossing: New Leaf tips. These will aid new players and 'Crossing veterans alike, and help you start building your fortune from day one. 1. Hit every rock in your town with a shovel or axe. Each day, one random rock spills out thousands of Bells when you strike it, and another contains a precious piece of ore.
2. For maximum Bells per rock, dig some holes behind you to create a buffer that will stop you being pushed backwards from the ricochet of your shovel. This will slow you and enable you to get even more Bells out of the rock per day. 3. Shake every tree, every day. Some contain Bells, some have furniture jammed in their branches, and others hide rare insects. Watch out for bees, though: hide in a house if you knock down a nest. 5. If a neighbour gives you a fruit (or if you bring back fruit from the island), don't sell it. And definitely don't eat it. Instead, bury it to plant a tree that will yield more foreign fruit every few days. 6. A good place to find new tropical fruit is during the island tours. Take a break from your current objective and borrow some fruit from the nearby trees. Remember that you must plant bananas and coconuts on the beach. 7. And if a friend is playing Animal Crossing: New Leaf, too, offer to trade fruit. 8. Each village will grow perfect fruit, which look like gold and are worth loads in the shop. Make sure to plant it to grow a perfect fruit tree, but always plant one of the resulting fruits. This is because perfect trees will die after a few shakes. 9. You can stack fruit into groups of nine. Just drag identical pieces of fruit on top of each other in your inventory. 10. Like their daddy Tom Nook, Timmy and Tommy will upgrade their pokey little Nookling Junction shop if you become a frequent customer. Buy a bunch of items or spend a load of Bells and it will turn into a convenience store. 11. Buy Fortune Cookies from the Nooks every day, as they contain special Nintendo-themed items. You'll need two play coins (you earn one of these for every 100 steps you take while your 3DS is in your pocket) for them. 12. Re-Tail buys items for about 20 percent more Bells than other shops, so don't bother trading your items with the Nook siblings. 13. Read the sign outside Re-Tail. It lists two items that are worth a premium on that day. If they're easier to find, go find them and sell them. 14. You can use the locker in the train station to store stuff until you buy a cabinet (or wardrobe or chest of drawers) in your home. That's especially useful when you're stuck living in a tent. 15. Once you are officially made mayor, you can spend 20,000 to enact city ordinances. You might want to make shops open earlier or later to match your playing schedule. 16. There's also the Bell Boom ordinance to consider. This forces shops to give you more Bells for stuff to boost the economy. This also makes items more expensive, but you can counteract this by buying stuff in a friend's village. 17. The quickest way to build up your mayoral approval rating is by donating to the museum. Fossils, insects, fish, and paintings are all worth a lot to the community. 18. Your first public works project should be a bridge. This will help you traverse your small island more quickly by adding a much-needed extra route across the river. 19. Ask Isabelle for advice, and she'll sell you useful equipment (like a watering can or fishing rod) and give you free items. This is a good place to find your first piece of foreign fruit. 20. Another way to get the watering can is to wait for the gardening shop to open. For this to happen, you'll need to be mayor for five days and plant a tree or flower. 21. If you want a tree to grow, don't plant it in the shadows or too close to another tree. Also, some fruit trees only grow on sand (bananas, for example), while others must be rooted in grass. 22. You can make hybrid flowers, which are worth more in the shop. To do this, put two flowers of the same genus but of different colour (such as two roses) in the spaces next to each other. 23. Every Sunday, Joan will visit your town and sell you batches of ten turnips at a random price. From Monday to Saturday, you can then sell them at Re-Tail. The buying price changes every day, though, so you'll have to check in daily. Turnips go rotten in a week, so don't wait too long. 24. Take any fossils you dig up to the museum and get them appraised. You can then donate the ones the museum doesn't have, and sell any duplicates. 25. Different types of fish live in the river, the ocean, and the small holding ponds around the village. The ocean is your best bet for finding animals that are worth loads of cash. 26. Pay off your first house loan as soon as possible to get access to the island. The island is the best place to make money. It's buzzing with rare insects, fish, and deep sea critters that will make you a fortune back home. 27. The only place to find a wetsuit is in the shop on the island. It's not there every day, and you'll have to pay in medals, so keep checking and keep playing the tours (the mini-games). 28. You can use the D-pad to quickly change tools. By pressing left and right, you can cycle through your equipment. Hit down to unequip your current item. Handy. 29. Equipment will be removed from your inventory while you are holding it. So, you can make space by putting on your wetsuit and holding one of your tools. 30. If you want to find people in the town quickly, whip out the megaphone, hold 'A', and say the name of the inhabitant you want to find. If that inhabitant is relatively close by, she'll shout back. 31. 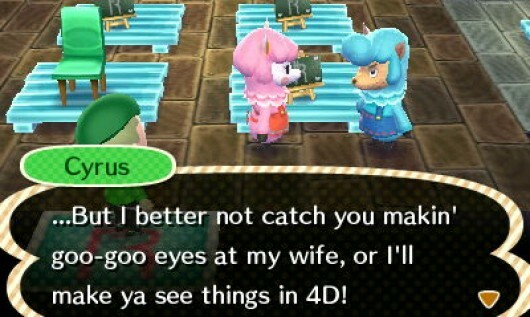 If you're invited to do something by a villager, do not turn her down. She'll be upset if you do. 32. Talk to Sable, the Able sister who is using the sewing machine in the clothes shop, every day to coax her out of her shyness. This will eventually enable you to unlock some new items and features. 33. Take screenshots by pressing the left and right shoulder buttons at the same time. Your snaps will be saved to your device or SD card, depending on how you set up the 3DS photo app. Want to find other players? Feel free to drop your friend code in the comments section below. Feel free to share your own tips with the PG community here, too. This site has a LOT of super useful guides. Especially a face guide so you don't get "ugly eyes". I am Midget from "Shire"
By the way,I have pears in my village! I've got Apples as a town fruit and am growing some oranges and peaches. I've got a few extra oranges to give out and one peach.